I have finally finished a project that I’ve been working on for the past two and a half years (though not continuously – moving, buying a house, finding a new job, planning a wedding and honeymoon, and living life got in the way): a scrapbook of Ryan and my trip to Venice, Cinque Terre, Nice, and Paris. Also known as my first trip out of the U.S. Also known as the trip when Ryan proposed. Also known as the trip that confirmed a future full of travel for the two of us. We obviously have great memories from this trip, so I wanted to make sure to capture the special moments, beautiful places, and the fun activities we experienced througout the week and a half we spent in Europe. Scrapbooking seemed like the perfect solution. It’s been a hobby of mine for almost 10 years. I’m definitely not an expert, but I’ve found that it’s a relaxing activity and it produces some amazing results! I love playing around with different layout ideas and finding creative ways to make each page different. Plus, it’s a way to give more meaning to the pictures from our travels. Many scrapbookers journal on the pages and, while I haven’t done much of that in this scrapbook, it’s something that I will likely incorporate in the future. Without getting too much into the details, I want to share a few of my layouts from this scrapbook. 1. Exploring Venezia. Much of our time spent in Venice was exploring the fish-shaped island. 2. Castello Doria. A castle on a high point in Vernazza that was used as a lookout for pirates. The views were spectacular! 3. Colline du Chateau. Castle Hill is the best place to go for breathtaking views of Nice. 4. Arc de Triomphe. From the top and the bottom, the Arc de Triomphe in Paris was one of our favorite sights to visit. 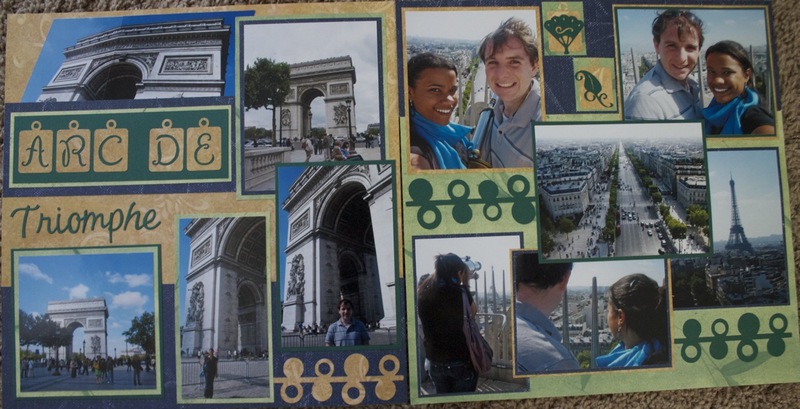 This is only a small subset of the pages I’ve created for this scrapbook of our 2009 trip to Europe. I can’t wait to share more! This entry was posted in Scrapbooking and tagged France, Italy, layouts, Nice, Paris, scrapbook, Venice, Vernazza by Kristin. Bookmark the permalink.